In general news, “yellow vest” riots continue in France protesting Macron’s policies. In Argentina at the G20 meeting, President Trump formed a “truce” with China over trade, halting tariffs for 90-days. 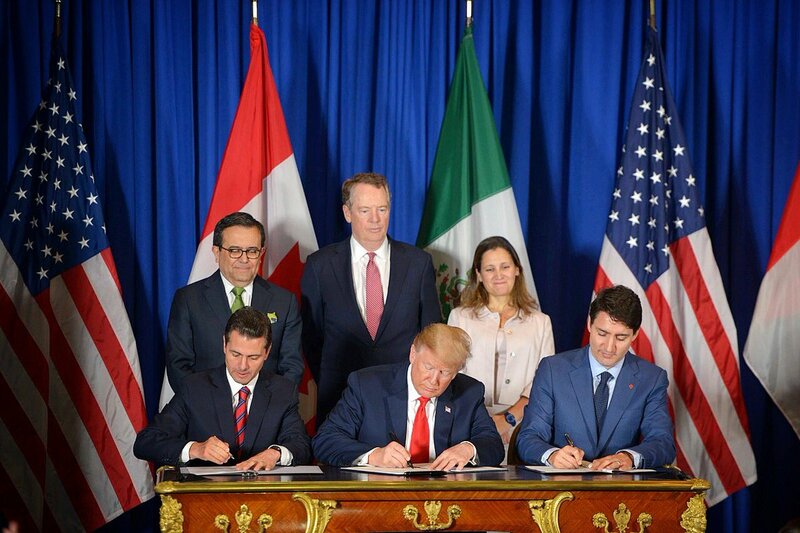 He also signed the USMCA deal to replace NAFTA. Russia’s attack of Ukraine naval ships caused Trump to cancel a meeting with Vladimir Putin. At the southern border, the caravan of migrants trying to cross caused Trump to close the busy port at Tijuana. In the U.S., George HW Bush #41 died, and a strong earthquake hit Alaska. In healthcare news, China announced that it would crack down on the illegal manufacture of deadly fentanyl that makes its way into the US killing more than 70,000 each year. Also, a Chinese scientist angered the global scientific community by announcing that he had used CRISPR to modify human embryos. In healthcare business news, Bayer cut 12,000 jobs as a result of the merger with Monsanto. Merck (MRK) plans to defy Trump and raise drug prices. Teva (TEVA) rigged the system by launching their generic competition to the EpiPen at the same inflated price as EpiPen. Also, Roche acquired Jecure for their non-alcoholic steatohepatitis (NASH) portfolio. On the data front, Vectura (VEC) cancelled their asthma drug after trial failure. Alkermes (ALKS) schizophrenia drug met endpoint. Bristol-Meyers (BMY) met endpoints in an Opdivo-Yervoy lung cancer trial. Vertex (VRTX) met endpoints in triple-therapy for CF. From the FDA, the agency recalled Teva hypertension drugs due to contaminated ingredients made in China and India that might cause cancer. Loxo’s (LOXO) larotrectinib was approved for a variety of cancers based on a specific genetic mutation. Celltrion’s drug Truxia was approved as a biosimilar to compete with Roche’s Rituxan. Catalyst Pharmaceuticals (CPRX) trials of drug Firdpase to treat a rare Lambert-Eaton Myasthenic Syndrome were put on hold. Zafgen’s (ZFGN) trials for diabetes were also placed on hold. Breast implants are back in the news for under-reported safety problems. Finally, the WSJ reported on how the FDA is approving more generics drugs to drive down prices.